Jones, Meadows, & Wall, PLCC is a preeminent law firm based in Knoxville, Tennessee. We have serviced the Knoxville area and surrounding community since 1996. Our entire staff is dedicated to helping clients with their legal matters regarding the following practice areas: -Family Law and Family Law Mediation -Commercial (Lending/Secured Transactions) and Real Estate -Transactions -Commercial Litigation -General Business -Contract and Entity formation Law Please contact our Knoxville law firm with questions about your legal issue. Provide as much information as possible regarding your inquiry. While this contact does not serve to establish an attorney/client relationship, it will allow our legal team to begin an assessment of your case. Our entire staff is dedicated to helping clients with their legal matters regarding the following practice areas: -Family Law and Family Law Mediation -Commercial (Lending/Secured Transactions) and Real Estate -Transactions -Commercial Litigation -General Business -Contract and Entity formation Law Whether you are anticipating the joys of adoption or experiencing the pain of marital conflict, the lawyers at Jones, Meadows, & Wall, PLLC will listen to your needs and help you reach solutions to your legal problems. 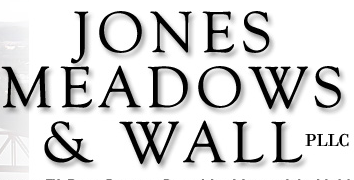 Jones, Meadows, & Wall, PLLC has served families in Knoxville for years. Our family law attorneys provide legal services in a wide spectrum of areas, including: -Adoption -Alimony -Child custody and visitation -Child support -Child support modification -Divorce -Juvenile delinquency and dependency proceedings -Mediation -Prenuptial agreements Adoption: While adopting a child brings happiness to families, adoption can also result in substantial heartache when something goes wrong. Jones, Meadows, & Wall, PLLC assists families with the complex legal paperwork and procedures of adoption so you can feel confident that the process is handled accurately and your child's well-being is secure. Alimony: Getting divorced is difficult, but it should not lead to a financial crisis. Our attorneys can help you establish fair and equitable spousal support, allowing you to continue to live as comfortably as before your marriage ended. Child custody and visitation: For any parent, child custody is the most heart-wrenching aspect of divorce. Our divorce lawyers will advocate for your parental rights so you can raise your children in a fit and healthy home. Child support: Both parents share in the responsibility of raising a child. At [name of law] our attorneys do everything possible to help your child receive the financial support they need for a healthy, happy upbringing. Child support modification: Child support payments remain the same unless and until the court modifies the child support order. If either the custodial or non-custodial parent experiences a significant change in circumstances, we can guide you through the proper legal procedures to modify child support payments accordingly. Divorce: Our attorneys stand by you throughout your divorce. We obtain the best possible results in court or at the negotiation table, and have extensive experience handling issues such as the fair distribution of assets, the division of a marital home, child support payments and child custody rights. Juvenile delinquency and dependency proceedings: When [name of state] authorities interfere with your parent/child relationship , you need a compassionate advocate who understands the bureaucratic red tape. Jones, Meadows, & Wall, PLLC is skilled at maneuvering through the complex laws of [name of state] to protect your parental rights and your child's future. Mediation: Mediation puts the decisions in your hands and often provides more expedient, predictable results than court trials produce. The skilled negotiators at [name of firm] can help you obtain a favorable divorce settlement. Prenuptial agreements: When you marry your beloved, you may not foresee the potential problems that can lead to divorce. The lawyers at [name of firm] expect the unexpected and draft premarital agreements that protect both spouses' interests. Having an agreement in place can alleviate some of the stress should you ever divorce. Knoxville and Tennessee Bar Associations.Biography: Phi Beta Kappa; Phi Alpha Delta. Member, 1990-1997, Chairman, 1991-1997, City of Knoxville Civil Service Merit Board. Commissioner, 1998- and Chair, 2007-2009, Knoxville Utilities Board. Member, Board of Directors, Leadership Knoxville, 2002-2006. Member, University of Tennessee Chancellor's Associates, 2006-2009. Fellow: Knoxville Bar Association. Knoxville and Tennessee Bar Associations. Phi Beta Kappa. Approved Rule 31 Mediator, Tennessee Supreme Court. Vanderbilt University, J.D.Member: Knoxville, Tennessee and American Bar Associations; National Association of Bond Lawyers (NABL). Associate Managing Editor, Vanderbilt Law Review, 1987-1989. Associate, Hunton & Williams, 1989-1997. University of Tennessee at Knoxville, J.D.Member: Knoxville (Member, Family Law Section) and Tennessee (Member, Family Law Section) Bar Associations; Hamilton Burnett American Inns of Court. Biography: Founding Member and Deputy Editor: "Tennessee Journal of Law and Policy," Sojourner Truth Moot Court Team. Recipient: Charles Miller Excellence in Advocacy Award; Dean's Citation for Extraordinary Contribution to the College of Law.